Erykah Badu recently scolded Wayne Coyne over the video the Flaming Lips leader made for their collaborative track "The First Time I Ever Saw Your Face," which Badu felt unfavourably and tastelessly portrayed the singer and her sister Nayrok. The experience hasn't soured the singer's affinity for film, though, as she's expected to appear in an upcoming screen adaptation of author Thulani Davis's 1996 novel Maker of Saints. As IndieWire [via Consequence of Sound] points out, a recent Kickstarter campaign successfully raised over $62,000 to get the project off the ground. The film will be directed by Gary Greig and based off a screenplay delivered by Davis. The Kickstarter page adds that in addition to Badu, other actors set to appear include Roger Guenveur Smith and Erik Todd Dellums, plus Yasiin Bey (aka Mos Def) is rumoured to be attached in some capacity. 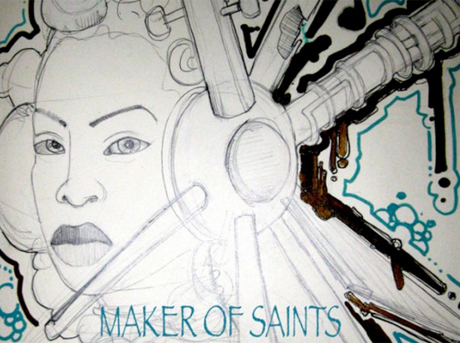 As for the story, Maker of Saints is set in Washington, DC, in 2008 after a young artist plunges to her death and focuses on how a friend of hers, as well as the worlds of art and politics, deals with the aftermath. The film will apparently capture "the inner workings of a world rarely seen, a thriving culture backstage, behind the backdrop of DC power and politics." A projected release date has yet been set, but it is expected to arrive sometime in 2013. You can watch a trailer for the project down below.